I love salads. I know a lot of people only try to order it to choose a healthy option or whatevers, but i seriously just love them. Love the different textures, colors, and flavors. That circular white thing is cooked egg white (microwaved, actually. I have no stove at my school place). I ate it on top of spinach, with poppyseed dressing (the only one I had). I used crumbled goat cheese, spicy&sweet pecans, and dried cranberries. Should have used a bigger bowl… it was super hard to mix. Anywho, one of those filling salads at a restaurant will run ya around $6.99 (or up to $9.99 if there is chicken and a piece of bread on the side). I bought the three main ingredients (cheese, dried fruit, candied nut) for 8 bucks at Trader Joe’s… including the organic spinach, for about 8 bucks. And I’m going to get five or six portions out of it. Kind of proud of myself because I actually portioned out the nuts and dried fruit so that I just have to dump it on my spinach and mix it all up. Could be a waste of zip-lock bags… but I think I’ll just reuse them. Definitely going to choose a salad to eat for the week and buy those ingredients. Dried fruit: raisins, apricots (cut up), cherries, figs? Nut: almonds, walnuts, cashews (except they’re expensive, so probably not). And then I can get all fancy and add sliced fresh fruit and such. I’m super duper excited… Is that sad??? Went for a really fun run yesterday. I know I shouldn’t be do the HMM runs yet, but I couldn’t help it. This one sounded really cool. They’re called “strength” runs, and this called for 6-miles with 400m recovery. The miles are to be run 10 seconds under race pace. Sooooo, yeah. I think when the Hansons do their training with their elite athletes, they need to do push-ups for every second they go under. That is a LOT of push-ups, friendo. Well, considering that it’s hard for me to do 4 REALY push-ups, 11 is just plain ol’ crazy. Came home feeling sooooo great, and I followed it up with a quick Pilates routine that worked the core, but also stretched me out. It was a perfect way to follow this run. Oh, and HAPPY HALLOWEEN… except I’m not dressed up because I’m boring like that. Are you dressed up for Halloween today? Did your office/workplace dress up? 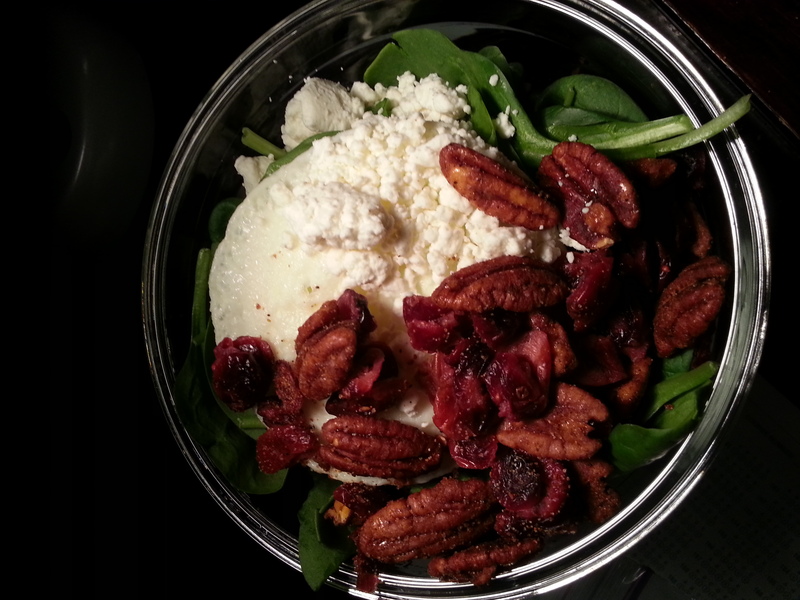 My Favorite Salad toppings are goat cheese, blue berries and candied walnuts, yum! Ooooh, yes! Blueberries instead of dried fruit saves on tons of sugar… and I can eat more that 1/4 cup, hehe. Great idea! oOOoh that sounds yummy (like a Mediterranean salad)! omgsh sweet & spicy pecans are the bomb!! pecans in general… drool!